Gracefully sweeping arms of faux antler hold 2 laced faux leather shades on this rustic game table light. 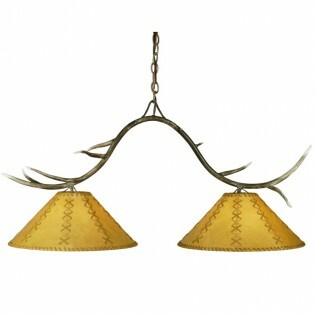 The Faux Antler Game Table Light can add a wildlife theme to your game room or kitchen island. Gracefully sweeping arms of faux antler hold 2 laced faux leather shades on this rustic game table light. The Faux Antler Island Light can add a wildlife theme to your kitchen island.